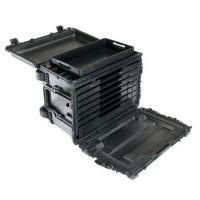 Pelican 0450-005-110, 0450-015-110 0450 Mobile Tool Case 20.56" x 10.97" x 12.65" FREE SHIPPING! Home > Pelican > Equipment Bags > Police Equipment Bags > 0450-005-110, 0450-015-110 0450 Mobile Tool Case 20.56" x 10.97" x 12.65"
Pelican 0450-005-110, 0450-015-110 0450 Mobile Tool Case 20.56" x 10.97" x 12.65"
have many police equipment bags to choose from. 0450-005-110, 0450-015-110 0450 Mobile Tool Case 20.56" x 10.97" x 12.65"
Pelican's large Mobile Tool Case from Pelican is the ideal solution for transporting a variety of tools. The interior offers plenty of drawers and compartments for efficient organization. Six one-inch depth drawers offer space for smaller items, while a deep compartment and a top tray in the lid store larger tools effectively. The addition of three unsealed pockets provide quick access to small items. The Pelican 0450 is durably constructed with heavy-duty buttress hinges and reinforced hardware. Despite its strength, it remains easily portable thanks to a trolley handle and wide-track wheel system. Automatic pressure equalization valves make it ideal for air transportation, allowing air to circulate throughout the case and preventing a vacuum from forming inside. Top Tray: 17.75" x 9.5" x 3.0"
Deep Drawer: 20.0" x 10.5" x 3.0"
6 Shallow Draws (optional): 20.0" x 10.5" x 1.0"
Interior Dimensions (L x W x D): 20.56" x 10.97" x 12.65"
Exterior Dimensions (L x W x D): 23.95" x 14.75" x 17.95"
©2002-2019 CopsPlus.com: Pelican 0450-005-110, 0450-015-110 0450 Mobile Tool Case 20.56" x 10.97" x 12.65" FREE SHIPPING!